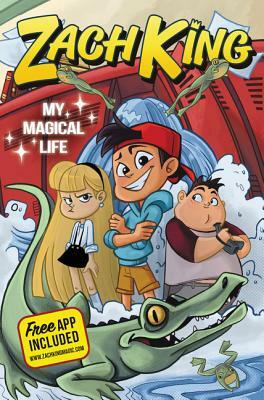 Award-winning digital media star Zach King brings his unique brand of magic to the first installment of a lively, fun-filled trilogy about Zach, a middle schooler in search of his magical powers while navigating the crazy, confusing world of public school. Big Nate meets DanTDM in a debut middle grade adventure by social media superstar Zach King. The book comes complete with a code for a downloadable app that brings Zach’s vibrant world to fully animated, three-dimensional life. Zach King: My Magical Life is also coming to theaters soon, as the project has been picked up by Steven Spielberg’s Amblin Entertainment. So his parents decide to stop homeschooling him in magical arts and send him instead to a regular middle school with regular kids. To Zach, it’s the worst news ever. Who wants to be ordinary when everyone around them is extraordinary? But Zach quickly learns that going to regular school with regular kids isn’t all that bad. Who knew having real friends would be so much fun? And just when Zach least expects it, he discovers a pair of magical snapbacks that might just be the magical thing he’s been looking for his whole life. The only thing standing in his way is the school bully, Tricia Stands. She’s determined to make sure Zach doesn’t get more popular than she is, and so she plans a prank so awful, so evil, it could cause the biggest disaster Horace Greeley Middle School has ever seen. For fans of Diary of a Wimpy Kid, Timmy Failure, and DanTDM: Trayaurus and the Enchanted Crystal and anyone who’s ever wondered where they belong, this is the perfect book for you.